This award-winning Canadian series follows Detective William Murdoch (Yannick Bisson, Sue Thomas: F.B.Eye) as he solves turn-of-the-century Toronto's most intriguing mysteries with groundbreaking scientific inventions and revolutionary forensic techniques. Aided by his eager deputy, Constable Crabtree (Jonny Harris, Hatching, Matching & Dispatching); gruff boss, Inspector Brackenreid (Thomas Craig, Where the Heart Is); and feisty coroner Dr. Emily Grace (Georgina Reilly, The L.A. Complex), Murdoch faces off against murderers, thieves, and dangerous criminals. He also continues his on-again, off-again romance with pathologist-turned-psychiatrist Dr. Julia Ogden (Gemini winner Hélène Joy, Durham County). During his investigations, Murdoch encounters the greatest minds of the day, like Sir Arthur Conan Doyle, Thomas Edison, Henry Ford, Winston Churchill, and President Theodore Roosevelt. Guest stars in this collection of Seasons 1-10 include Victor Garber (Alias), Simon Williams (Upstairs, Downstairs), Sarah Gadon (A Dangerous Method), Peter Keleghan (The Newsroom), Lisa Faulkner (Murder in Suburbia), and Nicholas Campbell (Da Vinci's Inquest), Peter Keleghan (The Newsroom), Patrick McKenna (The Red Green Show), Allan Hawco (Republic of Doyle), Thomas Howes (Downton Abbey), Lisa Faulkner (Murder in Suburbia), Matthew Bennett (Battlestar Galactica), and William Shatner (Star Trek). 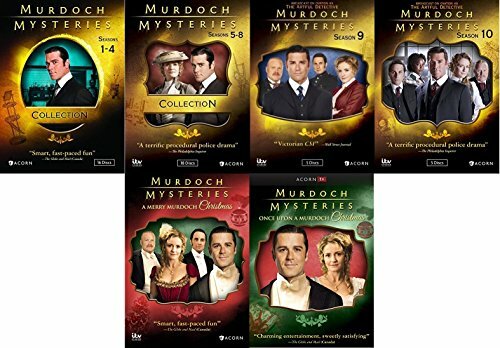 As a bonus, two movies, A Murdoch Mysteries Christmas and Once Upon a Murdoch Christmas are also included.